You wouldn't think it, but it turns out that Death is kind of a sentimental guy. 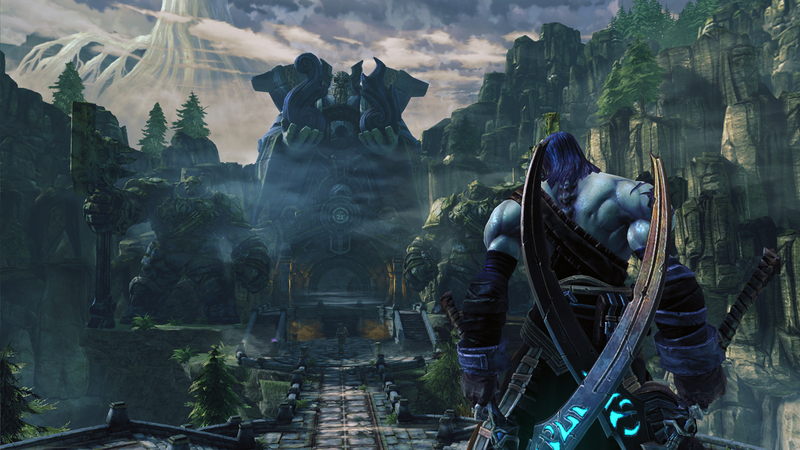 His brother, War, was imprisoned by the Charred Council at the end of the first Darksiders, and Death is looking for a way to free him. Admittedly, it's more about restoring balance to the world than any kind of brotherly affection, but it's still a nice thing for him to do. 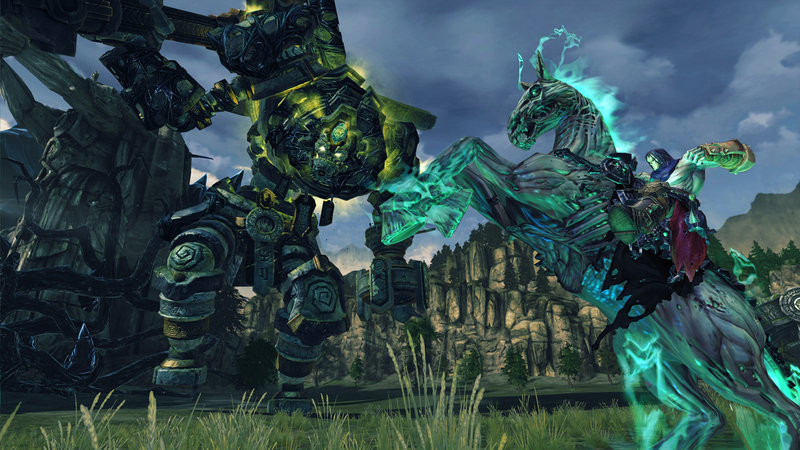 I played through the very beginning of Darksiders II, as Death sought out The Crowfather, keeper of secrets, to get a better idea of how he might rescue his fellow Horseman. The Keeper was at the top of an icy mountain dotted with chasms, drops, and plenty of mindless minions - an annoyance for Death, but a fine way to learn his new moves. He's more nimble than War, able to dodge out of the way of oncoming attacks. His basic weapon, a pair of scythes, are fast and furious and more than a little evocative of a certain other fast-moving action hero of Greek descent. He also has his choice of secondary weapon; I picked up a massive axe that did serious damage to enemies, but had a slow enough windup to make it impractical for frequent use. The combat was well-paced and the balance between quick attacks, dodging, and heavy attack never got too repetitious or boring. Fallen enemies will drop coin and gear. Something I really appreciated was how a piece of gear's information was displayed clearly and concisely, so that I could tell at a glance whether it was worth picking up or not. I could even equip it directly from the field, rather than having to drop into an inventory screen first, which kept the action flowing. In standard RPG fashion, the loot comes in tiers from common to epic, with named pieces providing bonuses when you complete the set. There are even possessed weapons, which become more powerful as they're fed. I didn't get to see any of that, but the idea of leveling up something by feeding seems in line with Death's general demeanor. Killing enemies racks up experience points, levels you up, and gives you skill points to spend in one of two skill trees: Necromancer or Harbinger. 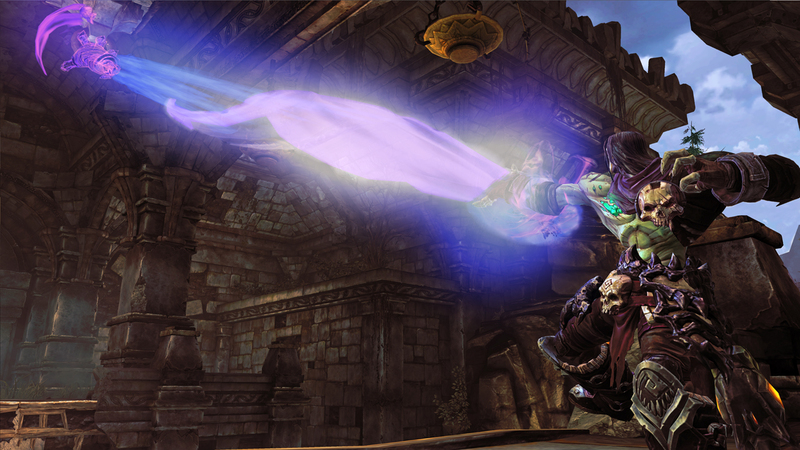 Necromancer skills favor combat abilities, such as increasing the chance for a critical hit or, my personal favorite, calling in a murder of crows to attack enemies. Harbinger skills are more spell-based, like setting foes on fire or teleporting across the battlefield to slash someone to ribbons. You can mix and match as you see fit, though why you'd want to do anything other than have a bunch of badass crows at your beck and call eludes me. It mean, come on, it's right there in the name - a murder of crows. 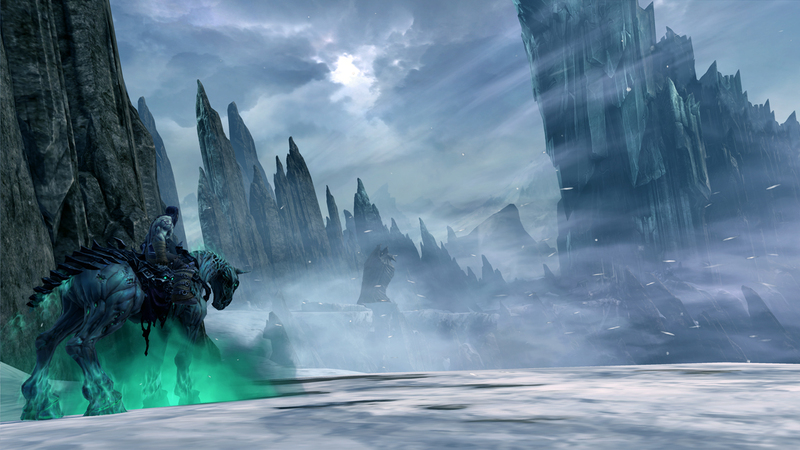 In addition to slicing his enemies into tiny pieces, Death is pretty agile when it comes to getting around. He can wall run, heave himself over wall posts to increase his travel distance, climb vines, leap from post to post, and hop across narrow beams. Pulling off his acrobatics is easy enough most of the time, but occasionally he'll get it into his head that you wanted him to leap out into nothingness instead of grabbing the next handhold, but falls are little more than a minor interruption as you'll typically be dropped back almost exactly where you were. 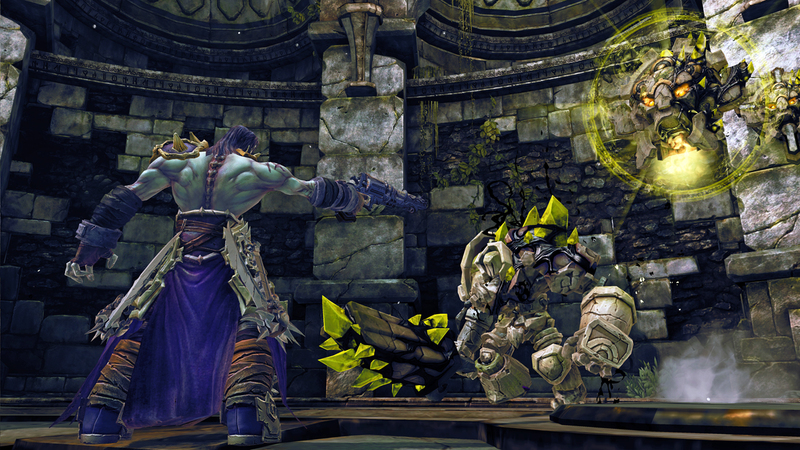 Darksiders II is massive (all of Darksiders would fit into the first zone of Darksiders II) and I only got to see a tiny snippet, but the action was fast and fluid, the art style nicely comicbooky, and the writing was a genuine surprise. The exchange between Death and The Crowfather as they bargain for information was quite engaging and made me want to know more about their history together. Of course then I had to go and fight War and things got a little messy. 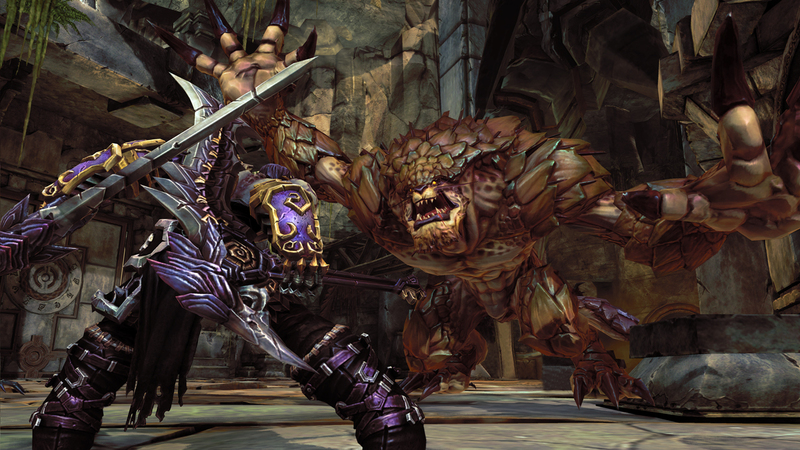 If you're looking for something to scratch your action game itch, Darksiders II is worth your notice. You can pick it up for Xbox 360 or PS3 on August 14.